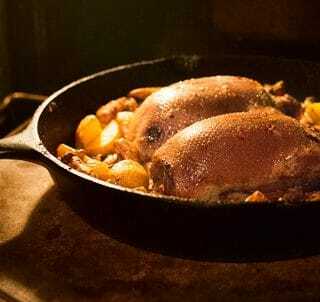 I love duck confit, but it can be a project. This is very much like confit, but it’s a far easier way to roast duck legs than traditional confit, which requires salt and time. I used to think this wouldn’t work with wild ducks or geese. But it does. Big time. Confit, pronounced “con-fee,” is a French method of preserving meats by salting them down to remove moisture and then cooking very slowly in their own fat. It’s wonderful stuff, and I have a recipe for duck confit here. Why is it wonderful? because you get meltingly tender meat topped with cracker-crispy skin. It’s salty, meaty, easy to eat with a bonus of crisp — and humans are hard-wired to like crisp. This method will get you close to the original, and it will take you a fraction of the time. The trick is to roast the legs in fat, in a small container that will just barely hold however many legs you happen to be cooking. This, more or less, will ensure that your legs are cooking in a bath of fat, not in the hot, dry air which will desiccate a wild duck or goose leg. I used the legs from specklebelly geese in these pictures, and I recommend them highly. Canada geese, snow geese, and the legs from big ducks like mallards, canvasbacks, pintails etc. are also good choices, and of course you can do this with store-bought ducks and geese. You want the skin on them, however. If, for some reason you have skinless legs, you will need to totally submerge them in the fat — and skip the crisping part in Step 3 of the recipe below. Snow goose legs cooked this way, then shredded, are amazing. Give this recipe a try next time you have a good day duck hunting. You will not be sad. Pat the duck or goose legs dry with paper towels. 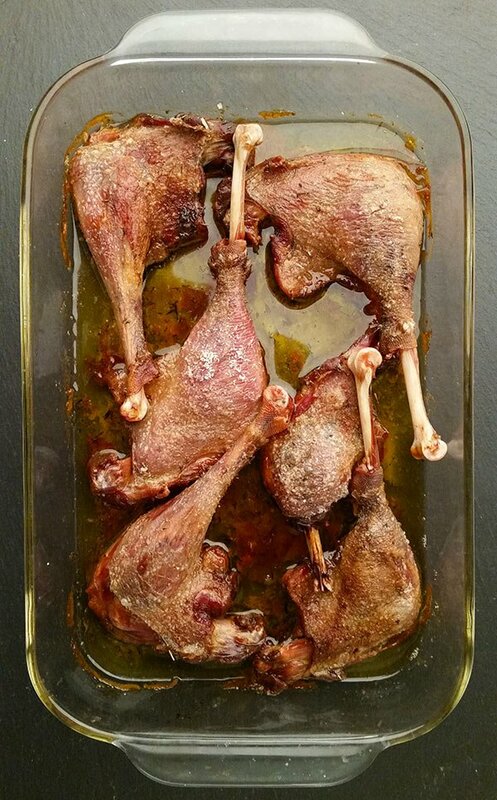 If you have store-bought duck legs, prick the skin of the duck all over with a needle or the point of a sharp knife. Do not pierce the meat itself. Piercing the skin gives the fat a place to seep out. 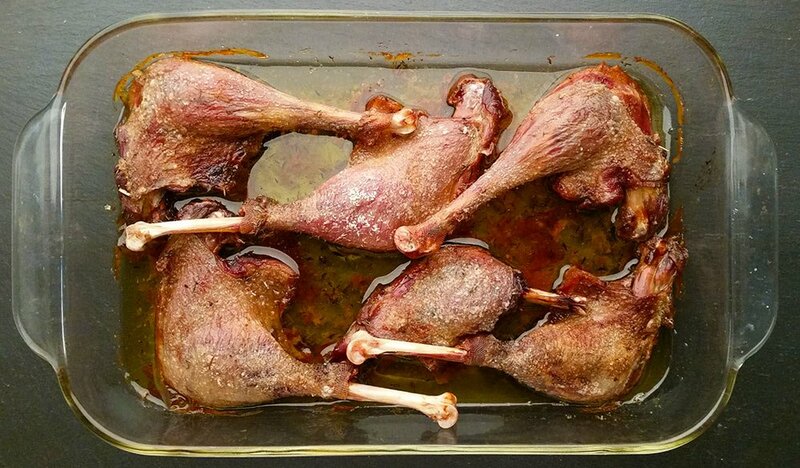 Salt your duck legs well and set them aside, skin side up. Let them come to room temperature for at least 30 minutes and up to 90 minutes. Put the legs in a small casserole. How small? You want the casserole to be just big enough to hold the legs. Now you need some fat. 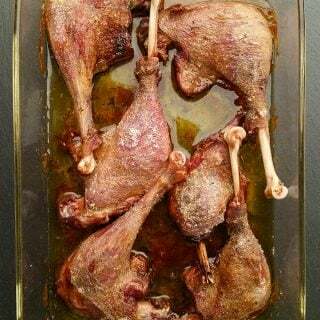 If the legs themselves are fatty, you will only need to pour a thin sheen of oil or melted duck fat on the bottom of the casserole, then place the duck legs close together, but not overlapping. If the legs are skinny, add enough fat to come about 1/4 inch up the sides of the dish. Put the casserole in the oven and turn it to 300°F; if you have a digital oven, you could even go down to 285°F. Do not preheat the oven. Every duck has a different level of fat, so doneness is more an art than a science. But it will take at least 90 minutes, and probably two hours, and even 3 or 4 hours won't hurt them. After 90 minutes, check the duck: It should be partly submerged in melted fat and the skin should be getting crispy. When the skin is starting to look crispy, turn the heat to 375°F. Check after 15 minutes. You’re looking for a light golden brown. Remove the casserole from the oven and let cool for 10 to 15 minutes before eating. Save the accumulated fat for cooking vegetables, other meats or for keeping your skin shiny. I strain the fat through a paper towel, but you really only need to do this if you are saving the fat for several weeks or months; strained, it will keep for 6 months tightly covered in the fridge. Well wrapped, the duck meat itself will last up to 2 weeks in the fridge. 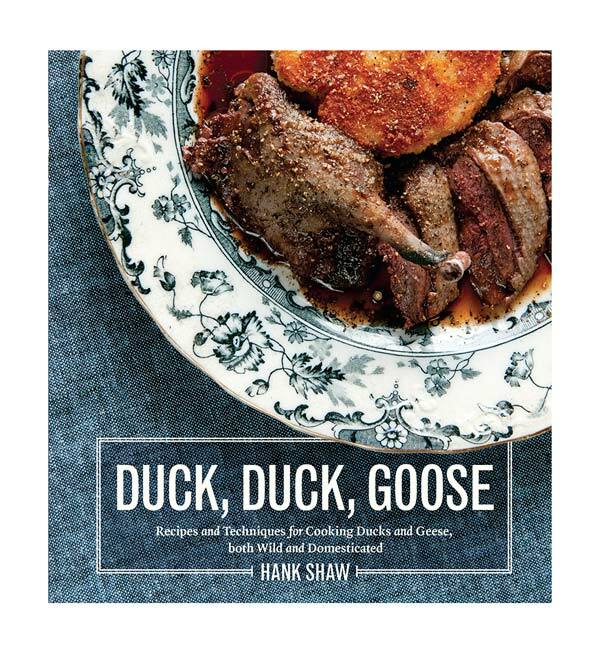 You’ll find nearly 100 recipes for ducks and geese of all varieties, both wild and farmed, here on Hunter Angler Gardener Cook! Holy moly this is unbelievably tasty and easy to execute. We were lucky enough to get a handful of drake mallards in CA this last season and we prepared most of the legs using this recipe. We also combined this with one of your other recipes, glazing the skin with honey sriracha and lime. I was almost upset with how quickly our guests devoured these legs, subsequently leaving me with less delicious legs than I had selfishly hoped for. Thanks for the recipe Hank!! For Persian New Year (Nowruz) on March 21, I’m planning to make a walnut-pomegranate stew called Fesenjan. I’ve always made it with chicken but an Iranian friend says that, traditionally, it was made with duck. Your method should work well. I’ll make the stew first and then add the cooked duck thighs and legs to meld the flavors for the last 30 minutes. I bet it will be delicious.